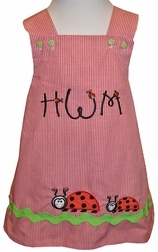 We just love, love, love, this ladybug and her baby outfit! 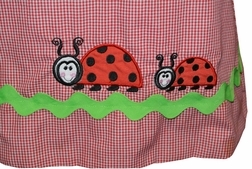 We start with red gingham, and decorate the bottom of the dress or top with green ric rac and mama ladybug with her baby. The shoulders fasten with two green buttons to match the ric rac. 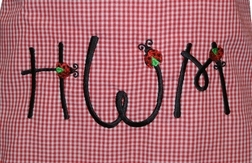 Monogram the dress/top in our new ladybug font as shown to make it even cuter!